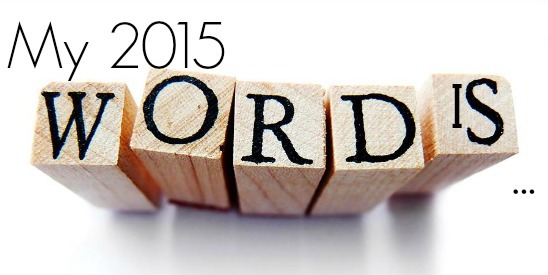 Each year I choose a word of the year. It started while I was teaching elementary school as a way to reflect upon and then change my teaching practice. Back then I would return to school the Monday after the last day of school to clean my classroom and put the school year to rest. Filling the recycling bin with leftover assignments from the year and taking down bulletin boards kept my hands busy while my mind quietly reflected on the good, the bad and the ugly from the year. Usually by the time my classroom was clean and put away for the summer, I would have decided where I wanted to focus my attention in the following year. At the beginning of each year I would hold my word as a touchstone. Each day I would refer back to it and when situations came up where my word was relevant, I would act accordingly. The year that everyone’s parents yelled at me, led me to not to take it personally the next year. That meant when I felt defensive about something I would exhale. A lot. And I would remember it wasn’t about me. Even when people blew sunshine up my skirt, I would remember it wasn’t about me. The year where I was crippled by anxiety because I was unsure where I would be the following year. I decided to say yes in order to flow with the uncertainty. That looked a lot like faith and trust and letting go. As I stepped away from the classroom to focus on raising my daughter and teaching yoga I continued choosing words to guide my years. I started using Rosie’s process to guide me to my words: connection and nurture being the most recent. Beginning in 2013 I started teaching this word choosing process as part of The Healthy Happy Sane Teacher program and in my Restoration Not Resolutions New Year’s Day workshop. If you’ve come to Restoration Not Resolutions, you’ve heard me talk about how part of my process in choosing my own word of the year involves thinking through the “shadow” aspect of my potential words. When I talk about the shadow I’m talking about the not so shiny, nice parts of a chosen word. Take my word last year, nurture. Definition: care for and encourage the development of. Seems really positive, right? Who wouldn’t want encouragement and growth? Well, I’m here to let you know, that these words can really come to life and give you lots of practice with them in unexpected ways. The year of nurture my mom had a paralyzing stroke. I love my mom, but our relationship is complicated and she lives 1200 miles away. Nurture took on an unexpected twist through this because it lead me to deeper self-care for myself, learning to accept help from friends and reaching out and leaning on family. Nurture became a powerful force in my life last year. And I have to say when I look back at all the words I’ve chosen over the years, each and every one has played an important part of shaping who ultimately I have become. In other words, I don’t choose my words lightly! I jokingly refer to “auditioning words” in December and January these days. What I mean by that is throughout the year words come to me. I add them to a list of potential words for the next year and sort of meditate on them and how they could play out if I choose to take them on the following year. Play – because let’s be honest I don’t need any help with work. Vulnerable – because I spent a LOT of 2014 feeling vulnerable and it was decidedly uncomfortable. Clearly, I need more practice. My girl, Brene talks a lot about how vulnerability is the birth place of creativity and innovation. And connection. Adventure – because our girl is growing up and I’ve got travel fever and I was thinking of this as being adventurous and trying new (scary) things. Compassion – because it is how we really connect to each other and how we can forgive ourselves. Value – because I underestimate mine. Seen/visible – because I’ve been hiding parts of myself. From you, from me, from the world… and it’s time to stop. Definition: full of or shedding light; bright or shining, especially in the dark. Going through the whole 20 question process, I feel like this word chose me. The part that sealed the deal for me is especially in the dark. The ability to keep shining even when things are grim, sad and dark is calling to me this year with the uncertainty of my mom’s health and the recent deaths of many of my loved ones’ loved ones. I can’t wait to see how luminous comes to life in 2015. I would love to hear from you about your word of the year, about MY chosen word of the year or about anything else you’d like to connect with me about.